Danish design studio KiBiSi have created a sofa that looks like a rolled-up mattress for furniture company Versus. Roulade appears to be curled up but is actually made from a fixed piece of high-density foam with oversized buttons referencing classic Chesterfield leather sofas. "The idea was to make a roll-up and unfoldable bed," designer Lars Larsen told Dezeen, but when that proved impossible due to cost constraints they still chose to keep the "jelly roll" shape, as it "gave us a great expression." Roulade is designed to complement KiBiSi's Brick sofa of stacked cushions, also for Versus. Other projects by KiBiSi we've featured on Dezeen include a pair of snow-proof headphones and a colourful bicycle with a baggage rack. In collaboration with Versus, KiBiSi launches the Roulade as friend and family to the Iconic Brick Sofa. Roulade is a meeting between generations and genres, a meeting between mattress and Chesterfield, chair and couch. Roulade is a Swiss Roll turned sofa – a contemporary, iconic and humorous character with a cosy and comfortable expression. Roulade is made from High Density foam cut into a fixed shape reminiscent of a rolled up mattress. 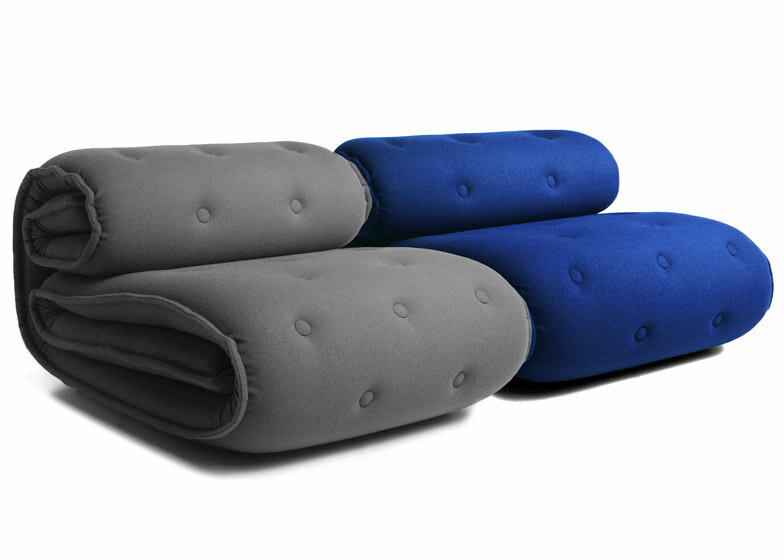 It is upholstered with top class materials such as Kvadrat fabrics, and the comfort and durability is outstanding. It is a sort of newcomer – a plump 1,5 pax sofa designed for laid back hanging out. Bespoke, oversized buttons modernise the old school Chesterfield expression.